The short-beaked echidna is the most widely distributed endemic Australian mammal, and echidnas from different geographic areas differ so much in appearance that they have been assigned to several subspecies. In this paper, we present data obtained from free-ranging echidnas in southern Tasmania, and compare this with studies from other parts of Australia. In Tasmania mating occurs between early June and mid-September, and throughout Australia the normal breeding season lies within these limits. In echidnas from the more easterly parts of Australia reproduction closely follows hibernation, with Tasmanian echidnas showing a signiﬁcant overlap between hibernation and reproduction. There is intense competition between males, and female echidnas from Tasmania show multiple matings. There are signiﬁcant differences between echidnas from different areas of Australia in the use of nursery burrows and maternal care. 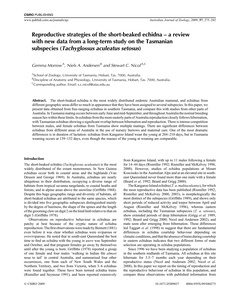 One of the most dramatic differences is in duration of lactation: echidnas from Kangaroo Island wean the young at 204�0 days, but in Tasmania weaning occurs at 139�2 days, even though the masses of the young at weaning are comparable.